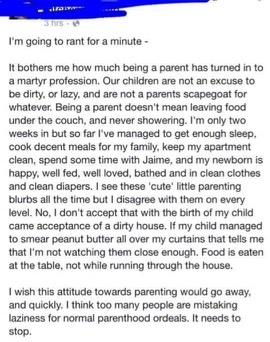 I don’t think any parenting blog would be complete today without sharing this wonderful Facebook status rant. Part of me hopes it’s a deliberate troll post (of course, the easiest way for me to make this blog go viral would be to make offensive statements about breastfeeding being close to abuse or how you’re all way more crap at parenting than I… I’d obviously be fibbing on both counts but it does draw the crowds) but the bigger part of me wants this to be genuine. I want this person to actually believe they know it all, because there is nothing quite like falling off one’s high horse, publicly and humiliatingly, to ensure you never utter a word which you are not qualified to ever again. Ahem, I assume. I want this person to remember what they posted when their potty training toddler has done a poo and hidden it in the curtains, and I want them to mentally apologise to each and every parent they patronised with this status for being such a complete and utter asshat. Two weeks in to first time parenthood is not always the easiest of times. This obviously depends largely on the hand (and the rest of the baby) you were dealt… I have had two very difficult two-week-old babies; I have spent that two weeks in pain after two c-sections, finding it hard and painful to feed, with just mere snatches of sleep. But even then, it is certainly not the hardest point, not by a long shot. Babies of two weeks don’t move, they don’t even roll. You put them down somewhere and, unless family pets or siblings come across them, they’re still there when you get back. Their cries are comparably quiet and their needs are simple. Feed them, burp them, change them, cuddle them. OK, this will occur at all times of day and night, but however you slice it a two week old baby will sleep, a lot. This leaves plenty of time for tidying, showering, or for most normal people eating biscuits and watching them constantly in case they stop breathing. You get a little further down the line. They start crawling and hauling themselves up on the furniture (this is the stage we are in now). You leave the Sudocrem out on a table and you come back to a very white carpet. It happens suddenly and you are not usually well prepared. Then comes walking, and all bets are off. Unless you can raise your entire household contents above toddler level then you need to invest in a play pen or just give up. I must say I’m extremely lucky, and I am enjoying the toddler stage immensely. The acquisition of language, the learning to reason, gaining real personality… It’s fascinating. But my word, it’s messy, and sticky, and snotty. It’s ‘why are all the toys out on the floor together?’ and it’s ‘no you can’t have a biscuit, OK, just one but you have to sit down, why are there crumbs in my shoe?’ and ‘how on earth did you get your nappy off?’. However, when your two year old decides she is dropping her nap for good, you really don’t stand a chance. Imagine being followed every minute of the day by a small, sticky hurricane repeating the phrase ‘mummy whatcha doing?’ whilst dropping crumbs and toys liberally over every surface. Yes, you could clean when they’re in bed (assuming that they do actually go to bed and stay there, quite a presumption) but in my opinion, any glorious free time is far better spent drinking wine, watching Netflix and eating all the good things that you would otherwise have to eat in secret. And then you do it again, and you have two hurricanes simultaneously working to destroy your house along with your mental health, and you really are screwed. And, by the way, I think having kids is the perfect excuse for being lazy. Why else would you bother? "Food is eaten at the table, not while running through the house." Whoever wrote that is in for a BIG shock when they enter the toddler phase! What a tw*t! Whoever wrote that is living in La-La Land. That's all I can say. I wonder how they are feeling six months on?? First child – nice clean house, sleep when baby sleeps, eat at the table etc. Second child arrives……..god save us, crazy, messy, dirty, loud. Third child arrives… Just give up altogether! Just wow – what an arrogant rant. Wisdom is realising how little you actually do know. What’s will the next rant be titled? Somebody needs to track this woman down! 2 years on… still as smug?